I love veggie burgers. Who doesn’t right? Well store bought veggie burgers don’t cut it for me. The rubbery texture and unidentifiable ingredients in store bought veggie burgers are enough to turn me off. You can get so much more flavor and texture from homemade veggie burgers. 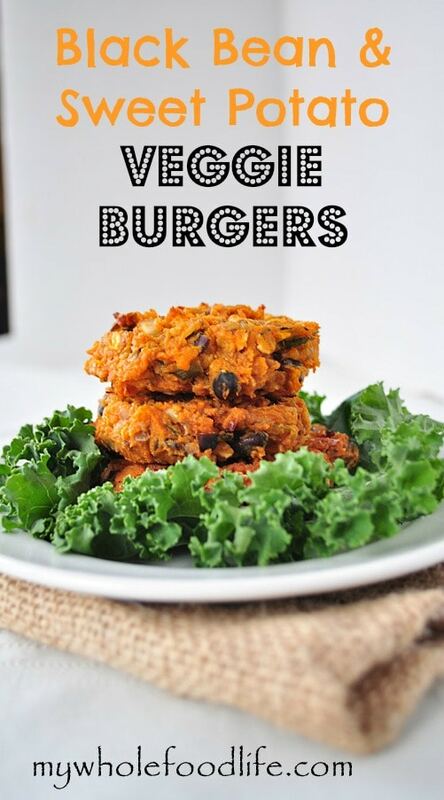 These sweet potato black bean burgers are a spin off my Sweet Potato Veggie Burgers. If you have made those burgers, you will love these too! I like to make sweet potato black bean burgers because they are easy and very budget friendly. The other day I had some leftover black beans I wanted to use as well, so I decided to combine the two and create a whole new recipe. These came out great. Sweet potato and black beans go very well together. A no fuss veggie burger recipe that you will love! Mix all ingredients in a bowl very well. Form the patties. I use 1/4 cup to scoop and measure mine. Place formed patties on a greased baking sheet . Bake for about 30 minutes, stopping halfway through to flip the patties. Store these burgers in the fridge for a couple weeks. You can freeze them for longer. I cook them and then freeze them all the time. Made these today and they were awesome, only patty I've made so far that didn't fall apart! I microwaved the sweet potato, mashed it and mashed the beans...I always make sure beans are very dry. I'm vegan so I used flax egg, topped them with vegan cheese, homemade relish, guacamole, sriracha and bean sprouts....oh so good!! Hello from the UK Melissa! I've only very recently discovered your blog and have just made these burgers - they were delicious, and so quick and simple to make (which is very important to me!) - thank you so much! Even my normally fussy 5 year old loved them. I read the section on "convincing the kids" and it's exactly what I'm trying to do with my son. We're slowly getting there, it just takes some perseverance and persuasion, but I'm determined not to have him growing up addicted to sugar and processed food. Thanks again for a wonderful blog and I'm looking forward to trying out more of your recipes. These were wonderful, great recipe! t I am not a vegan, but I am just trying to eat more whole foods. This might be a silly question, but what do you eat these burgers with? Do you all put them on a whole wheat bun or eat them without bread? What is flax egg? Is there anything else That would work instead? You can use real egg too. I used a flax egg to keep it vegan. Grams and cup are completely unrelated. Grams are mass; cups are volume. A cup is 240 mL a teaspoon is 5 mL). I've always been trying to figure out how people measure out grams in cooking. Do you use a scale to measure the mass? I made these tonight and everyone in my family loved them. They were great!!! I will definitely be adding these to my rotation for dinner. Thanks. Awesome! So glad you liked them Beth! Sorry, what is flax egg? It's an egg replacement made from flax. https://mywholefoodlife.com/advice/how-to-make-a-flax-egg/ you can also use real egg if you like. Great recipe! I enjoy with avocado or guacamole on top wrapped in a piece of lettuce. Easy recipe to make and freeze for later. Think you could use breadcrumbs instead of oats?